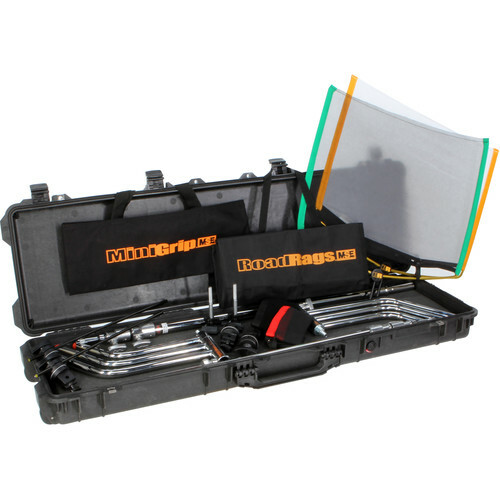 Specifically designed for the run and gun shooter who must move quickly and create studio quality images, The Matthews RoadRags C-Vival Kit contains two 40" Matthews C+, C-Stands, a RoadRags Kit which includes a single, double, silk and a flag and the MiniGrip Kit for quick mounting of the scrims and flags to the light stands. The 18 x 24" RoadRags kit includes a single scrim, double scrim, artificial silk and a black flag, two frames and a storage bag. The MiniGrip kit eliminates the need for extra stands. It consists of four 2" MiniGrip Heads with 3/8" and 5/8" mounting holes, two Mini Matthellini Clamps, and two 20" arms. If you already have stands and grip clamps, order the RoadRags Kit on its own: Click Here. Need larger size rags? Augment this kit with the 24 x 36" RoadRags II Kit: Click Here. The Century C+ Stand with Removable Turtle Base from Matthews features a 40" main riser with a removable turtle base. The unique staggered leg design of the C-Stand allows it to be nested and placed extremely close to one another on a set. This Matthews RoadRags Kit is a portable lighting modification system that helps you to quickly and easily duplicate studio lighting effects on location, using your portable lights. The elastic corded frames easily fold for storing and transporting. A simple "flick of the wrist" is all that's required to quickly open the frame making it ready to use. By using the different materials, you are able to quickly create contrasts, different light ratios, diffusion or block the light. The RoadRags Kit fits easily into most lighting kits. Additional fabrics are available separately. RoadRags are designed for use under a controlled environment. Wind and/or other weather conditions may cause damage to this product. Single and double scrim diminish the light. The flag acts as gobo, to totally block light. The artificial silk softens and diminishes the light. The Matthews Minigrip Kit consists of four 2" MiniGrip Heads with 3/8 and 5/8" mounting holes, two Mini Matthellini Clamps, and two 20" arms. The Minigrip Kit can be used with camera attachments and other accessories as well as lighting equipment. These miniature tools are ideal for tabletop photography, car interiors, and otherwise confined areas. The Minigrip Kit packs up into its own carrying bag. RoadRags Scrim Fabric, Single Black - 18 x 24"
RoadRags Scrim Fabric, Double Black - 18 x 24"
RoadRags Scrim, Artificial Silk - 18 x 24"
RoadRags Black Flag - 18 x 24"
Box Dimensions (LxWxH) 55.0 x 22.0 x 4.0"
Box Dimensions (LxWxH) 9.85 x 6.7 x 3.05"
Box Dimensions (LxWxH) 22.362 x 7.716 x 4.252"
RoadRags C-Vival Kit - 18x24" (45.7x61cm) is rated 4.5 out of 5 by 6. Rated 5 out of 5 by Photo James from C-vival kit rocks it I'll be using this kit for light modification and flags for portraits. Beautifully put together, quality construction and the C stands are massive. Pelican case. Very high quality offering. Something I'm having difficulty with is getting everything back into the case. It would be nice to have more than one of each flag or scrim, or include an additional size. For the price, it would be a small concession on margin and really be a value plus. Rated 3 out of 5 by Anonymous from Good Travel kit I use this product to support a light kit during interview scenarios. The only thing the kit lacks... and its kind of important... is some real C-Stand Arms. the two little arms and grips including with this kit are a poor substitute. I have yet to find a practical use for them, but maybe thats just me. Still a good foundation for a customized kit. Rated 5 out of 5 by Brian from Great compact, portable grip kit If you need a basic, portable lighting control kit, this one is a great choice. The kit comes with two C-Stands (with removable base), a Minigrip Kit and a RoadRags Kit (18x24). You set up your C-Stand, add on the mini head and arm from the Minigrip kit and then add a flag, scrim or silk on the end to control your light. Note that this kit doesn't include the full-size, metal Hollywood Head and Arm that normally accompanies the C-Stand. The head and arm is a small, lightweight set designed to support simple items like flags and scrims. You can always purchase a separate head and arm to get the full use out of the included C-Stands if you need that option. The great thing about this kit is that it allows you to bring a portable grip kit to every location gig. Everything stores inside a thin, long Pelican case with wheels, making it easy to tote around. A bit expensive but those who use Matthews Grip Equipment know it will last forever. Rated 5 out of 5 by John from Great, Versatile Kit This is a great kit for smaller, run and gun, and doc productions. Can be a bit heavy given the two c-stands--but let's face it, c-stands are just plain heavy. It is still very compact. The kit can be used to rig to standard light stands if weight becomes an issue. However it's a pretty complete kit and great for travel. The Road Rags are of good build quality and a snap to set up. All-in-all it's a great kit for productions on the move.